Hobbits and Ents, Balrogs and Elves, the excitement of the Watcher on the Water sending out his multiple tentacles or the Riders of Rohan in pursuit of the Orcs, the grandeur of the Great Hall Meduseld of the Rohirrim, or the city of Minas Tirith, and the poignant farewell of Sam and Frodo are only a few of the scenes and characters conjured up and brought to life by Joan Wyatt. Each of the paintings in A Middle-earth Album is based on a specific incident in the great epic The Lord of the Rings. Tolkien lovers will delight and rejoice in the accuracy and imagination of this portrait album of the world of Middle-earth. "A Middle-earth Album: Paintings by Joan Wyatt inspired by JRR Tolkien's Lord of the Rings" presents 30 paintings which are quite diverse, ranging from action scenes to landscapes (her best) to surreal (Amon Hen); some paintings are excellent (The Parting Feast, Rivendell, ...) while others are mediocre (The Balrog); the Hobbits are acceptable but not outstanding; ents are unique and funny; sometimes the characters or monsters have comical elemens which makes some of the paintings a bit like cartoons. The running commentary is appropriate but obvious to anyone familiar with the books of tolkien. Overall the paintings are quite pleasing and original. We have to remember that Tolkien art at the time of publication was dominated by the Hildebrandt brothers calendars. They had a complete different approach to make Tolkien art (working with pictures taken from people in costumes as a starting point. Ms. Wyatt's paintings are light years removed from that kind of art. She works with a more muted palette and her paintings are lively and full of motion. Some paintings do connect with paintings from artists who we know very well. The painting named "The Fellowship enters Moria" shows blue colors and a layout which makes me think of the work by Ted Nasmith (but he would have done it with much more detail and perfectionism), other paintings make me think about John Howe, or even Alan Lee. 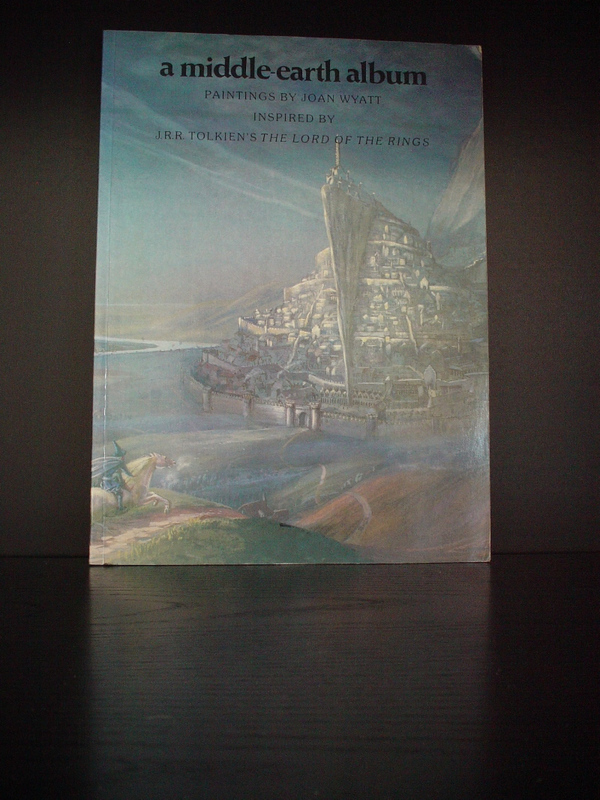 Interestingly we can read at the site of Ted Nasmith: "In time I became a member of The Tolkien Society, having discovered their whereabouts from a notice printed inside an art book of Joan Wyatt Tolkien paintings. With encouragement from them I again approached Tolkien’s publishers. This time they responded positively, offering to include four of my works in the 1987 compilation calendar. Breakthrough at last! " Maybe Joan Wyatt did leave some impression on the artists of today and maybe even had some influence. Allthough all of them have reached levels in art which cannot be compared to the works of Joan Wyatt, this book shows us some nice work and is certainly a nice book to have in your collection.